RAID and a failed disk. 04-Aug-2012: Updated for the Arch 2012 installer. 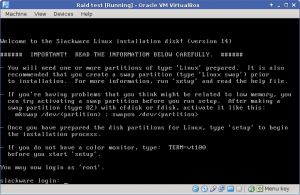 This article shows a way to install Slackware Linux on our server with software RAID (Redundant Array of Independent Disks). We will use RAID level 1, mirroring. RAID 1 is the only RAID level that can be used on the boot partition, because bootloaders (which read the boot partition) do not understand RAID, but a RAID 1 partition can be read like a normal partition. RAID 1 doesn’t protect your data, it will only protect you against a failing hard disk. 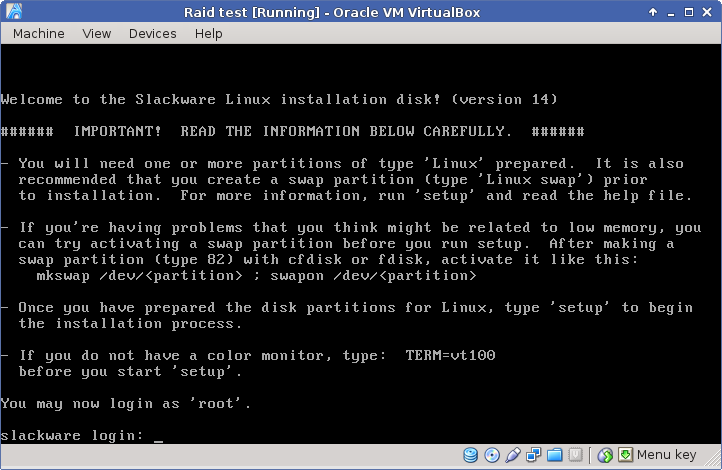 It is assumed that you have some experience installing Slackware Linux. This article is written using a Slackware distribution, but the procedure can be used on several other Linux distributions, specially the distributions that allow manual installation. /dev/sda1 + /dev/sdb1 = /dev/md1 (25 GB active OS root). /dev/sda2 + /dev/sdb2 = 2 swap partitions, about 4 GB each. /dev/sda3 + /dev/sdb3 = /dev/md3 (LVM space for data partitions). Install Grub on both hard disks. Boot the Slackware Installer CD. After selecting the keyboard you will see the login prompt after a while. Login as root without a password. Use fdisk to partition the first hard disk. Building a new DOS disklabel with disk identifier 0x85ea19a0. A whole lot of messages will follow, but in the end it should tell you that all went well. If not, start over again. First we need to load the RAID modules, then we can create the RAID arrays. We must set the metadata for the array to version 0.90. The newer versions like 1.0, 1.1 and 1.2 are not supported by most boot loaders, so you can only use 0.90. The swap partitions are not in a RAID array because there is no point in putting swap memory on RAID. Instead we will use two swap partitions in our server so that the swap will be balanced over the two disks. The next step is to prepare the swap partitions and start setup. In setup, when you come to the setup of the swap partitions, you will see that the prepared partitions are detected. Answer all next questions and the two partitions will be added to the /etc/fstab file. Next select /dev/md1 for your Linux partition, select the ext4 filesystem (may be the best choice in this setup). When done, don’t select the other (/dev/md3) partition, we will do that after the system is installed. Then continue the installation, for the server you only need packages from the A, AP, D, L and N series. You can deselect some packages you really don’t need. At least I would install the complete L series. In the A series, deselect lilo, we will use syslinux to boot the system. When the package installation is complete, and you have done the menus to configure the new system, don’t reboot yet because there is no boot loader. We will install syslinux by hand. It is easier then lilo, you only need to do this once. There are also some nice tools to put in the boot menu. First step is to install the MBR boot records on both drives and then to install syslinux on the raid array. Now create a minimal syslinux.cfg file, later we will expand this file. Now exit the chroot environment and reboot. Now that the basic system is installed some changes need to be made to finish the RAID installation. Create /etc/mdadm.conf and fill it with the data of your running arrays. Then with your favorite editor append the email address where to send RAID alarm messages to. It is safe to continue the installation on the md3 array, it will get in sync sometime. Here is the status of the system when disk 1 is dead, in other words /dev/sda is missing. Do take note that /dev/sdb now shows as /dev/sda but the underscore on the blocks line should give you a hint that it’s the first drive that is gone. Now, get a new drive and place it in your server. But first move the old second disk to the place of the first disk or we will have boot failures. If you put the new drive at the first position the systems BIOS will be confused because there is no MBR on the new disk. In our example, we couldn’t get a 640 GB drive, but we got a 900 GB drive instead. With the old surviving drive as first drive, the new one as second drive, turn the system on and it should boot without problems. The next thing we should do is rebuild the RAID arrays on the new drive. We start by copying the partition tables. Now rebuild the raid arrays. Bringing your new drive up to date will take hours to complete. Now wait until the disks are in sync again. In the meantime you should reinstall syslinux on the new disk, but only after /dev/md1 is up to date! In /etc/rc.d/rc.M the lines to start smartd are commented out, you need to remove these comments so that smartd will start at system boot. Again, you cannot receive any mail yet because there is no mailserver at this stage.